Advance voting in the Vancouver municipal election is practically unattainable for a vast majority of people who are poor and Aboriginal. Advance polls shut out the most vulnerable of Vancouver's population: the homeless and the poor residing in the Downtown Eastside, Mt. Pleasant, Grandview Woodlands and East Hastings. Mark Handley, a First Nations man filed a human rights complaint with the BC Human Rights Tribunal on Tuesday, October 28, 2014, citing that this population is being discriminated against based on ancestry, place of origin and source of income, with preferential treatment being given to wealthier people living on the west side of Vancouver. 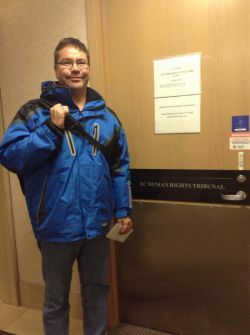 "There is a large percentage of Aboriginal people who are homeless, do not have access to a computer to register to vote and do not have identification," stated Mr. Handley. "They are further disenfranchised by not being able to get to advance polls between November 4-12, 2014 because they do not and cannot afford to travel outside the communities they live in." Each of the east side designated advance polling stations are an average of 50 blocks away from the downtown core, making them unattainable for the majority of poor and marginalized people. Said barbara findlay, a Vancouver human rights lawyer, "It is incomprehensible why the City would establish the service of advance polls, then deny that service to the people most marginalized in this City, especially when issues such as housing are top of the municipal agenda. In my view this is contrary to the Human Rights Code. What effect the City's actions would have on the results of an election are hard to predict." There was a formal request made to the City of Vancouver on October 23, 2014 to open up three additional advance polling stations on the east side of the city. The next day the City Clerk and Chief Election Officer responded by letter that they will not entertain the request, even though three community organizations have already stepped forward to offer their locations as advance polling stations at Trout Lake Community Centre, Britannia Community Centre and Union Gospel Mission. In addition, over forty community groups across the city signed and supported the formal request for three additional advance polls that were already willing to host in east Vancouver. "It is very telling that priority is given to the west side of the population who have 9 days to vote at their leisure while the east side of Vancouver only has one day to cast a ballot, due to the fact that advance polls are not available where the people live," stated Mark Handley. Mr. Handley is still awaiting word on the outcome of his Human Rights Complaint against the City of Vancouver and whether or not there can be an intervention to support voters residing in east Vancouver.